Some people like the look of well worn and dilapidated toys as it matches the aesthetics of their house or shop etc; however, I believe they are unaware of the hidden dangers that lurk within old toys because old toys were either painted or coated with lead paint and therefore not ideal for children to play with. Pre 1950’s the paint can contain up to 50% lead. From the 1950’s till the late 1960’s paint still contained more than 1% lead. From the 1970’s it was limited to no more than 1% lead. From 1992 to 1997 it was limited to no more than 0.25% lead. From 1997 paint can contain no more than 0.1% lead. For this reason I personally don’t feel comfortable with young children playing with unrestored Rocking Horses or toys of any kind as the paint will most likely contain traces of lead; therefore I can not in all good conscience sell an unrestored horse for children to play with. I don’t believe any of our modern paints from local suppliers contain lead as it is not mentioned on the tin; if lead is present, labelling is mandatory. Some people just give old horses and toys a coat of clear over the top to maintain the look and match their aesthetics; but this is only a very thin layer between the children and the underlying lead paint. I don’t feel this is a sufficient solution if a child is going to play with it; I believe it is however fine to apply a clear coat is it is just to be used purely as a collector’s item or show piece as this retains the original patina. How do I combat this without stripping the horse back to bare timber? I generally don’t strip a horse bare, although I can if requested; I remove all flaky paint and feather all edges, then I fully gesso all old horses with up to 6 – 8 coats of gesso depending on the condition of the horse; then 2 thick coats of oil based undercoat, then 2 thick coats of oil based top coat, then 2 thick coats of clear Polyurethane. I believe this gives a fairly thick and durable coating over any existing paint that may contain lead. 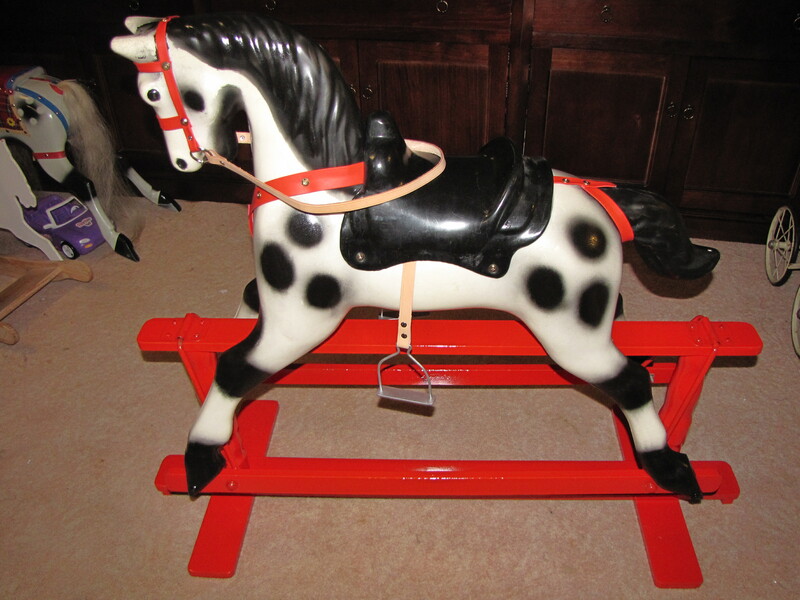 How do I tell if a Rocking Horse is Victorian, Antique or Vintage? This is an ever present problem with people tagging something with a label to make an item more attractive to the buyer. The term “Antique” is a term universally accepted to place an item in an era; this era is 100 years or older. Likewise with “Vintage” which is 50 years or older. Victorian is dated between 1837 and 1901. Plastic Rocking Horses really didn’t start till the 1970’s. Fiberglass not really till the 1960’s. Many times on auction sites etc we see horses which are incorrectly labelled as “Vintage” or “Antique”. So how do we know how old a Rocking Horse actually is? Well; the chances of an Australian Rocking Horse being “Antique” is fairly slim. Sure there are still Australian Rocking Horses over 100 years old; but these horses can only be a Roebuck which started making rocking horses in Australia in 1880, Bartlett which started making Rocking Horses in 1913 and Lou Peets in 1915. There are very few turn of the century Roebuck Rocking Horses still in existence; so; if you see an Australian Rocking Horse labelled as “Antique” then you can be 99% sure it is mislabeled. The majority of Rocking horses still surviving are post WWII; this does however make many of them “Vintage” or close to it. 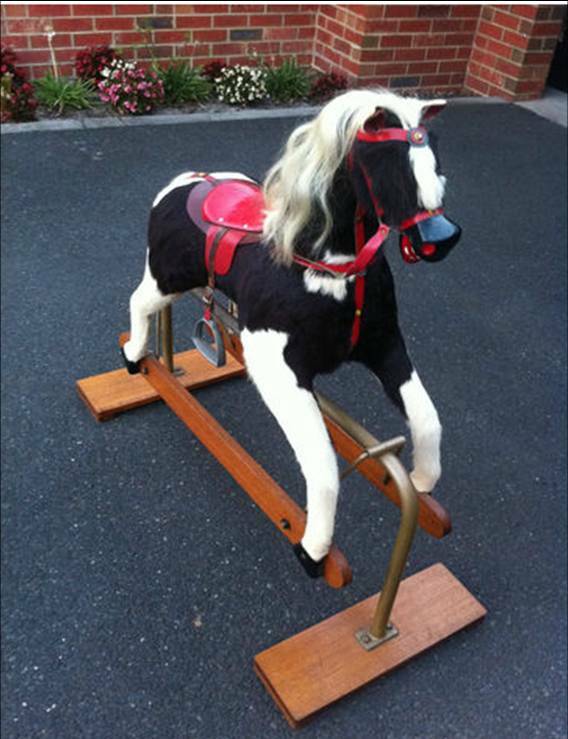 There are many turn of the century English Rocking Horse still available; but not that many in Australia; and those are brought in and owned by collectors. 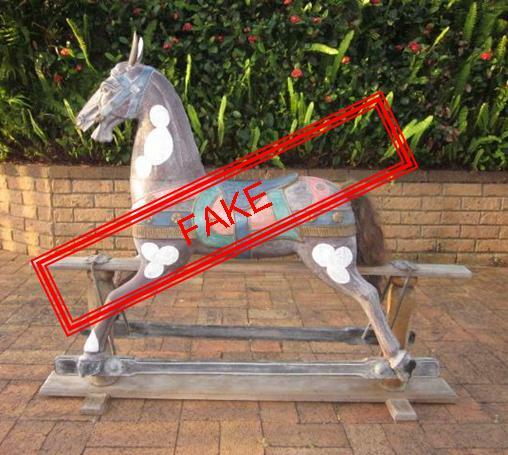 Also; Plastic Rocking Horses are generally from the 1970’s and Fiberglass from the 1960’s; so if you see a plastic horse dated 1940’s; don’t fall for it. 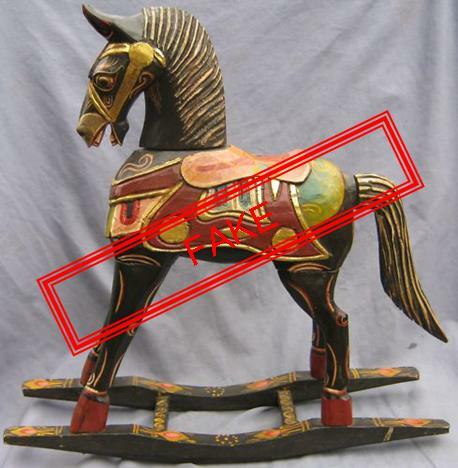 There are however five particular types of Rocking Horses which are constantly misrepresented on general auction sites; these are often advertised as “very old”, or “Antique” or “Vintage” or “1800’s”. You often see them with descriptions such as “belonged to my great Grandmother” or some such dribble. In actual fact; most are lucky to be 15 years old. I have even seen an Asian reproduction Rocking Horse advertised on a general auction site as “Elizabethan”. These are actually made in Asia with an “Antiqued” finish and sold through trading houses as 1800’s out of Countries like Germany to give them some credibility. If a Velocipede were genuine, then you would not find it on general auction sites and would be commanding many thousands of dollars. The genuine German and French ones were often fur covered and are extremely rare now days; it is extremely unlikely that we would find one here in Australia; if there were one; the owner/collector would not part with it; nor would they put it on a general auction site. Most of these are Balinese; once again “Antiqued”. Same as above but made in the Philippines. It is unlikely these are either “Victorian”, “Antique” or even “Vintage”; put simply, they are most likely 1980’s or younger; in fact; they can still be purchased new here in Australia at Equine Manufacturing. There were some old English Hide Covered horses made; as was some early Australian ones made as early as 1948; but it is highly unlikely these will have survived due to shrinking and hardening of the hide etc. 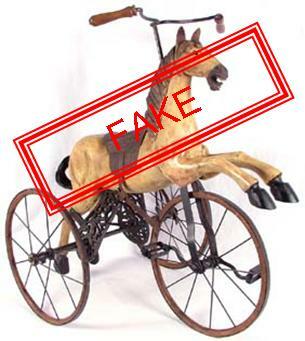 It is important to note here that it isn’t the manufacturer that is misrepresenting these horses; it is the sellers. In Australia, these were made by Australian Rocking Horse Mfg., Lindsay’s and some by Cyclops. They certainly are not “Antique” or even “Vintage” since they were only made from 1974. Those made by Australian Rocking Horse Mfg had a cast made from a late model Roebuck and went into production after the Roebuck factory closed. Some of these were sold to Lindsay’s as their Deluxe model. The advantage of polyethylene horses is they are lightweight, the disadvantage is they are nowhere as strong as timber and paint does not stick to it long term. Therefore when people paint them up it all tends to come off again and their hard work was in vein. The only real way is to clean them with Sugar Soap, heat the areas in which you wish to paint and whilst the plastic is hot, spray with acrylic paint so it is trapped in the pores when the plastic cools. Apparently now days bumper bar paint will stick, though I haven’t personally tried it. THE ROCKING HORSE, A history of moving toy horses by Patricia Mullins. This covers most major Rocking Horses from many countries and gives an excellent insight to the various Rocking Horse styles that have evolved around the world. A KISS OF ROCKING HORSES, A Directory of British Rocking Horse Makers pre 1950 by David Kiss. This book focuses in on the history of the British Rocking Horses, the various trading names, dates and addresses etc; if you need to find identify some minute detail of a certain British Rocking Horse, then this book will most likely have the answer. In short; Caveat Emptor (Let the buyer beware). If a buy seems too good to be true; then it probably is. If you are not sure about the legitimacy of a Rocking Horse; contact a reputable Rocking Horse Restorer; NOT and Antique Shop or Dealer. 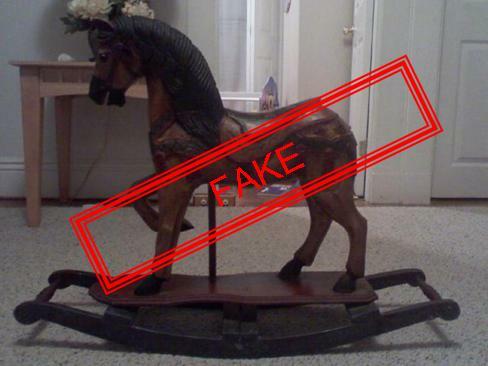 Tip; it is unlikely you will find an “Antique” or “Victorian” Rocking Horse for sale on general auction sites…Sorry to disillusion you; that bargain most likely isn’t. Paint is an extremely important part in restoration or making new toys. There is no point in going to all of the trouble and effort in doing a good job if you use the wrong paint. Choose your paint carefully; in my opinion; Acrylic paint is good for painting walls and ceilings in houses where it is not getting constant bumping and scratching; but not so good for painting children’s toys. Acrylic is a synthetic product. Acrylic; whilst quick drying easy clean up and convenient to the painter; but it is not a hard wearing paint when used on children’s toys. It remains relatively soft when dry. It is designed simply to cover the surface of the timber; but not designed to penetrate and bond into the grain of the timber. It is less likely to withstand the knocks and bumps of children playing. Whilst there is a great range of colours; there is little depth in those colours. Oil is a mineral; timber is a mineral. Oil Based enamel is definitely a little more work for the painter in the clean up department; however; it is a much harder wearing paint when used on children’s toys. This is because it is designed for the oil to impregnate into the grain of the timber. Because the oil impregnates the grain; it nourishes the timber, thus protecting not only the surface but the grain; thus bonding with the timber. Because of the bonding process and the compound of the paint; it dries much harder than acrylic paint; therefore it is less susceptible to chipping. The added bonus of the oil penetrating is the depth of colour; the finish on a high gloss oil based paint makes you almost feel like you could reach through it with some colours. Which ever paint compound you select; make sure you select a quality brand; the quality control, testing and materials used will make for a much better job in the long term. After you finish painting; I suggest giving the job a coat of Polyurethane finish; this will give a near glass like finish as well as extra protection to your finished job. If you don’t want the glass like finish; you could do a mix 60 Gloss-40 Matt mix; this will give you less shine.